The proportion of children ages 6 to 18 with parents who have a bachelor’s degree or higher has increased substantially over the past decade—from 30 percent in 2005 to 38 percent in 2017 among fathers, and from 26 percent in 2005 to 36 percent among mothers. Racial and ethnic disparities in parental education persist, reflecting continued societal barriers to opportunity for some groups: While 45 and 46 percent of non-Hispanic white fathers and mothers, respectively, have attained a bachelor’s degree or higher, only 28 and 27 percent of non-Hispanic black fathers and mothers, respectively, and 16 percent of Hispanic mothers and fathers, have attained the same level of education. Since 1974, the percentage of children ages 6 to 18 whose parents have less than a high school diploma (or the equivalent) has declined substantially, while the percentage with a bachelor’s degree or higher has increased. For example, in 1974, 58 percent of non-Hispanic black children had a mother who lacked a high school degree; by 2017, this number had decreased to 9 percent. During the same period, the proportion of non-Hispanic black children whose mothers had attained at least a bachelor’s degree increased from 4 to 27 percent. Similarly, the percentage of non-Hispanic black children living with a father who has less than a high school diploma (or the equivalent) declined from 61 to 7 percent, and the percentage living with a father who has a bachelor’s degree or higher increased from 4 to 28 percent. Similar trends are seen for mothers and fathers of non-Hispanic white and Hispanic children (Appendix 1), and for parents of younger children (Appendix 2). However, the Current Population Survey (CPS) questions used to obtain educational attainment were changed in 1994 and weights were adjusted, so prior data may not be directly comparable with later years. In 2017, 12 percent of school-age children lived with a mother without a high school diploma, 23 percent lived with a mother who had a high school diploma and no further schooling, 29 percent lived with a mother who had some college education, and 36 percent lived with a mother who had a bachelor’s degree or higher. For residential fathers, the corresponding percentages were 12, 26, 25, and 38 percent, respectively (Appendix 1). 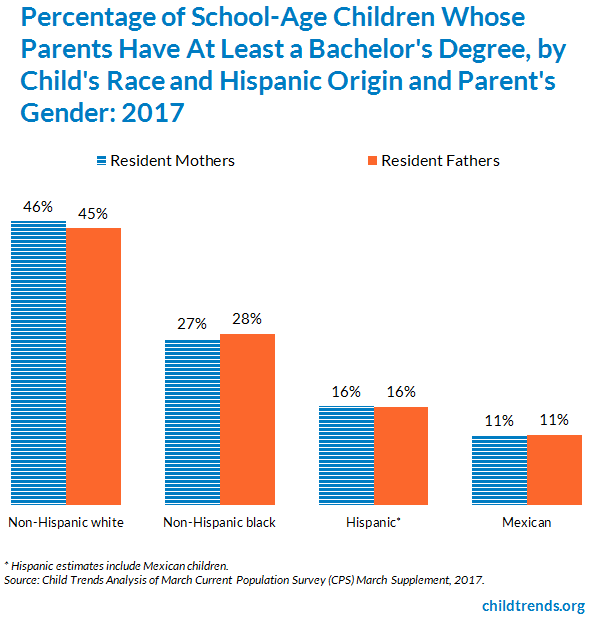 In 2017, 16 percent of both mothers and fathers of school-age Hispanic children had a bachelor’s degree or higher, compared with 27 and 28 percent of non-Hispanic black children’s mothers and fathers, respectively; and 46 and 45 percent of non-Hispanic white children’s mothers and fathers, respectively. Among Mexican children, only 11 percent of mothers and fathers had a bachelor’s degree or higher. Similarly, 31 percent of Hispanic children’s mothers and 35 percent of their fathers lacked a high school diploma, compared with 9 and 7 percent, respectively, for non-Hispanic black children’s mothers and fathers; and 4 percent for mothers and fathers of non-Hispanic white children (Appendix 1). * Hispanic children may be of any race. Estimates from the Program for International Student Assessment for 30 countries, including the United States, are available at https://nces.ed.gov/surveys/pisa/idepisa/report.aspx (select father’s and mother’s highest education under student variables). Data for 2007–2017: Child Trends’ original analysis of the Current Population Survey (CPS) March Supplement, 2007–2017. Data for 2005: KewalRamani, A., Gilbertson, L., Fox, M. A., & Provasnik, S. (2007). Status and trends in the education of racial and ethnic minorities [Table 5] (NCES 2007-039). Washington, DC: U.S. Department of Education, Institute of Education Sciences, National Center for Education Statistics. Retrieved from http://nces.ed.gov/pubs2007/minoritytrends/tables/table_5.asp. Data for 1974–1999: U.S. Department of Education, Institute of Education Sciences, National Center for Education Statistics. (2001). The condition of education 2001 [Table 4-1] (NCES 2001–072). Washington, DC: Author. Retrieved from https://nces.ed.gov/pubs2001/2001072.pdf. Current Population Survey, March Supplement. This indicator reports the highest level of educational attainment among parents living in the home of the child at the time of the interview. The category of “some college” includes associates degrees and vocational/technical school certificates and degrees.